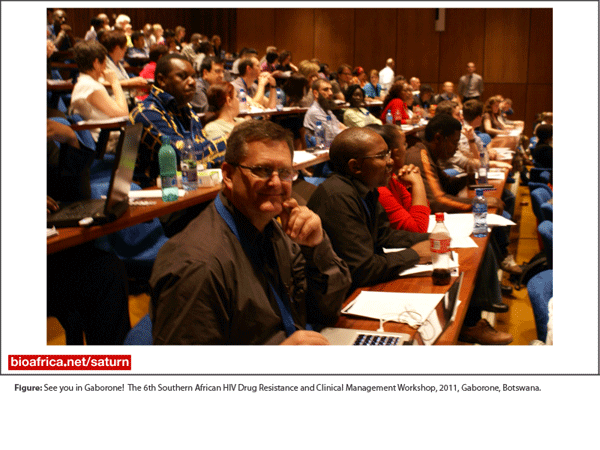 The Southern African Drug Resistance and Clinical Management Workshop is presented every year. The workshop includes theoretical lectures and practical sessions on the usage and interpretation of HIV-1 drug resistance genotyping in the management of HIV patients on anti-retroviral (ARV) treatment. This workshop is targeted at clinicians, clinical virologists, nurses, medical students and researchers working in the public and private sector who are currently involved in the treatment of patients with ARVs in Southern Africa. The 4th and 5th workshops were presented at the University of the Free State (UFS) Medical School in 2009 and 2010. This workshop, to the best of our knowledge, is now considered the top regional meeting on HIV drug resistance and clinical management. In total we have trained nearly 1,000 physicians and nurses as part of this workshop. For example, in 2010 we got 436 applications and 215 participants attended the workshop, representing in total 17 countries. We also had 22 presenters. These included the CDC/PEPFAR Chief of the AIDS Treatment and Care Branch in South Africa, Prof. Jeffrey Klausner, the director of the HIV resistance program from the World Health Organization, Dr. Michael Jordan and some of the top international and national HIV clinicians and researchers. In 2011, we had 345 participants in the SA AIDS Drug Resistance Satelitte Meeting, We have also presented the 6th Southern Africa HIV & TB Drug Resistance and Treatment Monitoring Workshop, Gaborone, 7-11 November 2011. This workshop was divided in two, 7-8 Nov as the SATuRN annual workshop (attended by 227) and the second part, which attended by 79 Botswana physicians that were selected and sponsored by their Ministry of Health for further training on HIV drug resistance and clinical management with SATuRN. To the best of our knowledge this is now considered to be the best regional workshop on drug resistance and treatment monitoring. This year we had 227 participants confirmed the participation of many leading international and regional scientists including: Prof. Mark Wainberg (MacGill, Canada), Prof. Vladmir Novistiky (Harvard, U.S.), Prof. Anne-Mieke Vandamme (REGA Institute, Belgium), Prof. Peter Godfrey-Faussett (LSHTM, U.K), Prof. Annatjie Peters (CDC, South Africa) and many others (complete list of the 31 presenters is seen at the http://www.bioafrica.net/saturn/ website). 7th South African HIV & TB Drug Resistance and Treatment Monitoring Workshop, Cape Town International Conference Centre, 28 to 29 November 2012, Cape Town, South Africa.